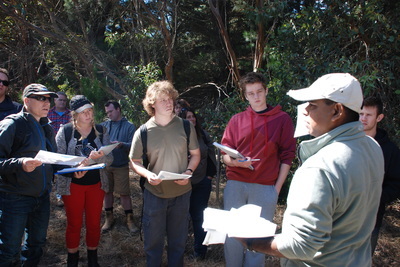 Visit the Bird surveys and Plot Monitoring page to find out more about techniques applied and why monitoring is important as a benchmark for measuring success (or failure) and enabling adaptation. Ballarat Uni graduate student Tim Simpson (centre) at a plot corner on the ImLal South site, 2010. 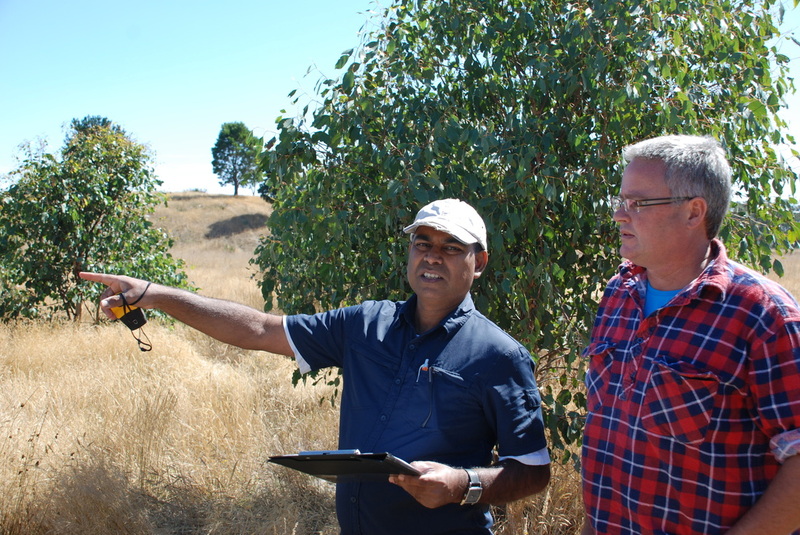 Monitoring of plant mortality and growth rates ought to be considered an essential part of a landscape restoration project. The information obtained can be used to influence the choice of species for future restoration projects, thus limiting losses and providing savings with regards to cost, time and effort. 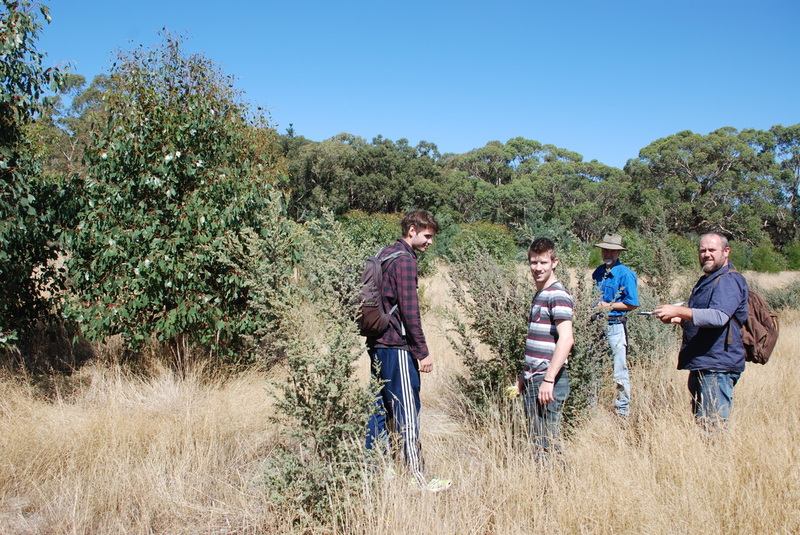 Biorich plantations aim to achieve diverse well-structured woodlands capable of regenerating themselves for centuries to come, supporting significant numbers of native fauna while incorporating commercial species that provide economic benefits to the land managers. As a relatively new approach, little is known about the degree of success of this style of plantings. 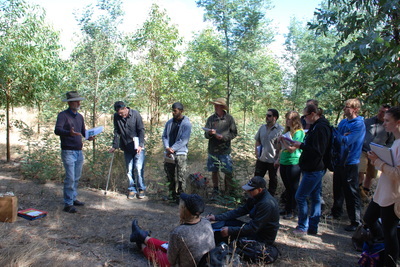 Consequently, BRT approached Associate Professor, Singarayer Florentine, at the University of Ballarat’s environmental management school to aid in scientifically examining the survival and growth rate of species planted in October 2010 on the ImLal South site as part of the Biorich Plantation Demonstration project, and also to establish long term monitoring plots. 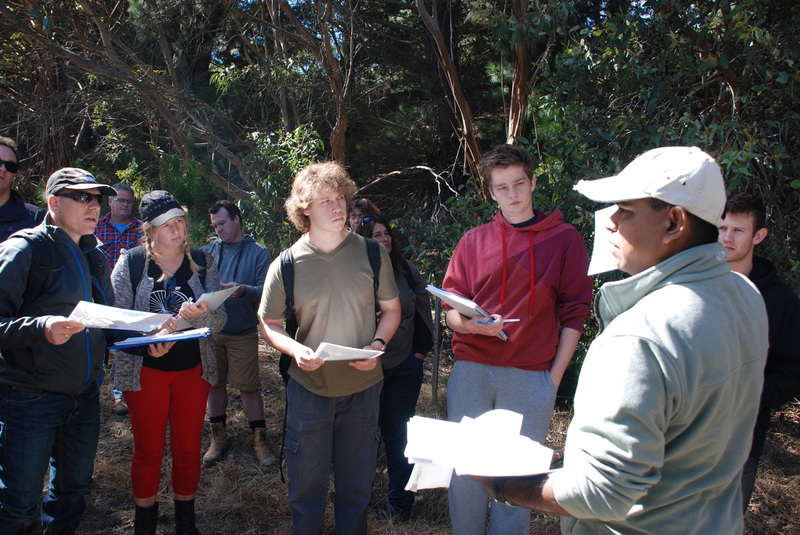 Given that the uncertainties in restoration planning can never be overcome, the concept of adaptive management and the notion that a restored site be regarded as a long term experiment represents a sensible perspective. 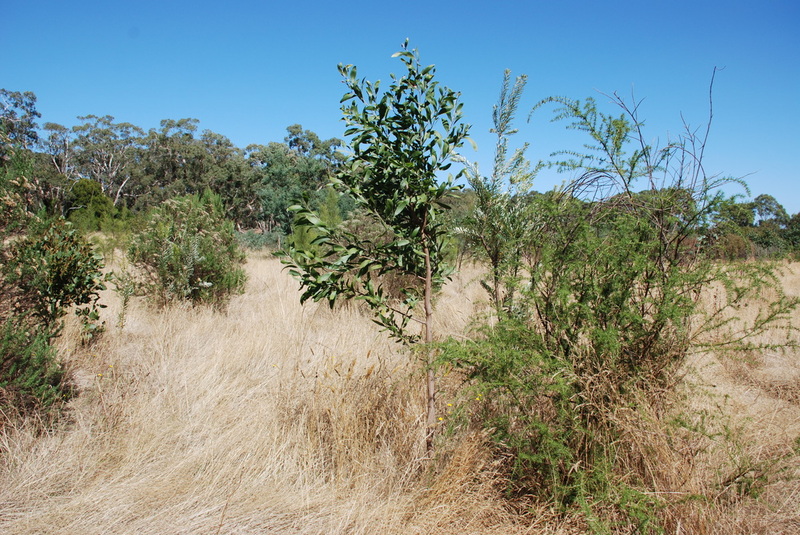 Unfortunately, in practice, the lack of post restoration monitoring and research has meant few opportunities to improve the theory and practice of ecological restoration. 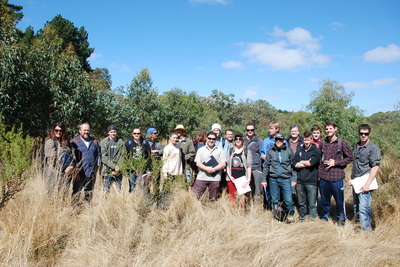 Therefore, the objective of this University of Ballarat study was to scientifically assess the effectiveness of revegetation at the ImLal Biorich Plantation by establishing long term monitoring plots, collecting data on survival / growth rates and providing information that can be used for future restoration projects, helping to ensure successful outcomes. In order not to skew monitoring results, it is essential to develop and apply a systematic, quantitative evaluation approach. 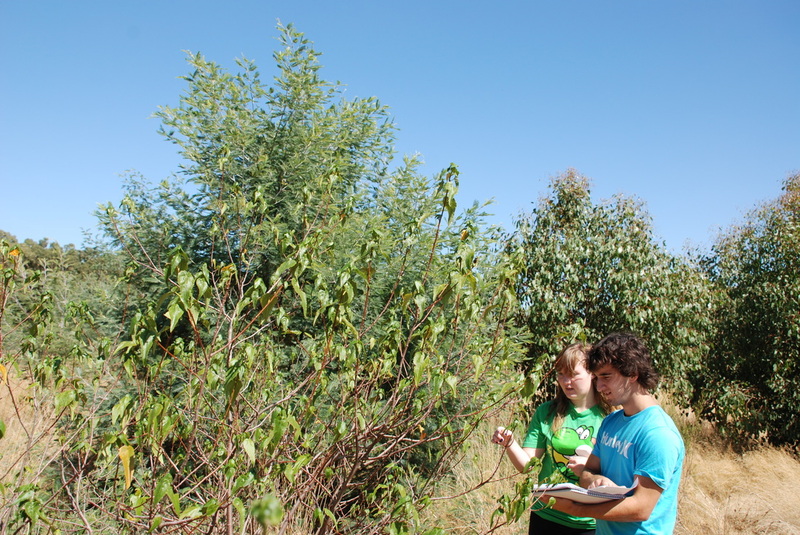 To establish a baseline for measuring survival status, graduate student Tim Simpson established permanent monitoring plots within the biorich plantings, and in nearby remnant and pre-restoration sites, as a comparison. Within each plot, planted species were identified, and also recorded as to whether they were alive or dead. Over the year from October 2010 to 2011, the surviving seedlings mortality, height and diameter were measured and recorded. Observations regarding frost damage or grazing were noted. As a first step in plot selection, the boundaries of the Imlal South site were defined using Map Info GIS with a registered aerial photograph. 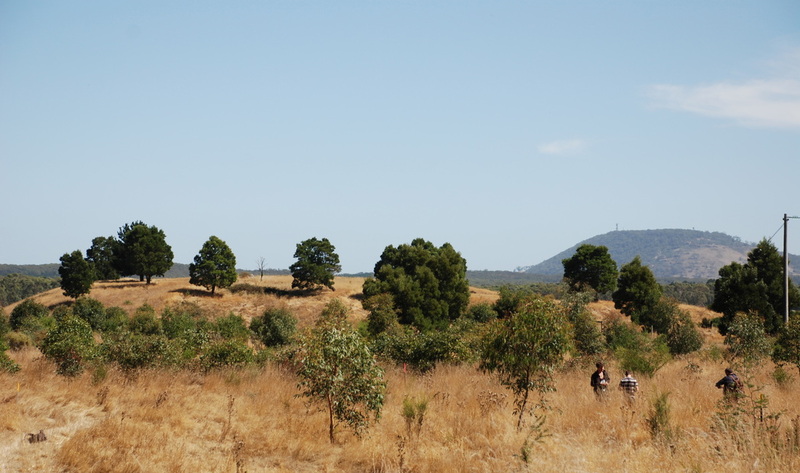 Once the perimeter of the site was established, a total of 36, 20m x 20m plots were overlayed with approximately 12m buffers between each plot in all directions. Six of these sites were deemed unsuitable due to planned direct seeding in this section. The remaining 28 plots were each allocated numbers (1 to 28) with corresponding numbers written on paper. The paper numbers were then folded and placed in a hat. Fifteen numbers were randomly drawn from the hat and these were established as permanent plots for the study (pictured left). 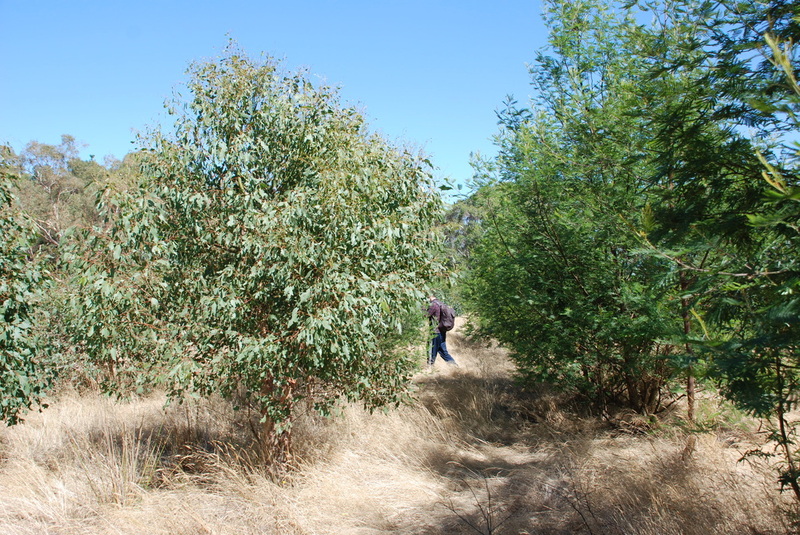 Similarly, another two 20m x 20m plots were also established in a remnant area as a benchmark and another two in a pre-restoration area. This will show comparisons over time between remnant and re-vegetated sites. 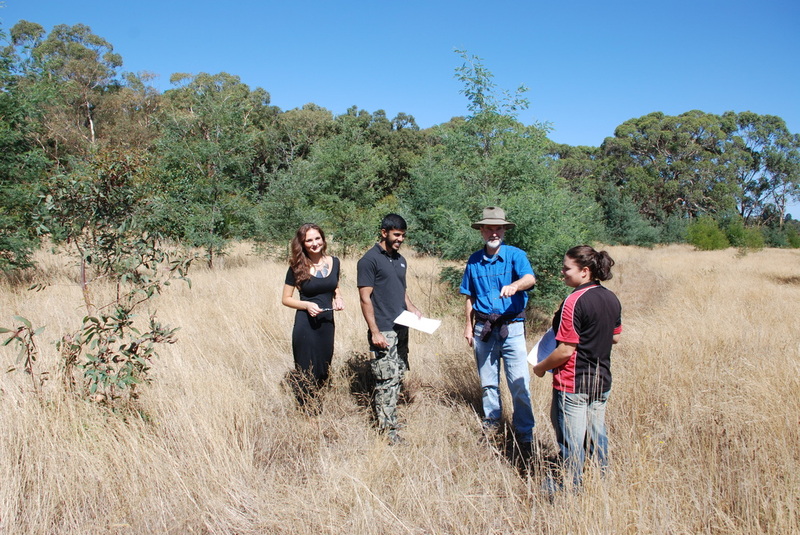 The data collected in these remnant and pre-restoration sites was not used in this study. Each plot was located from the GIS layer via GPS and a fencing dropper driven into each corner and labelled with numbered metal tags. The plots are all orientated in a northerly direction. Temporary string lines were used to divide each plot into 4m x 4m grids. 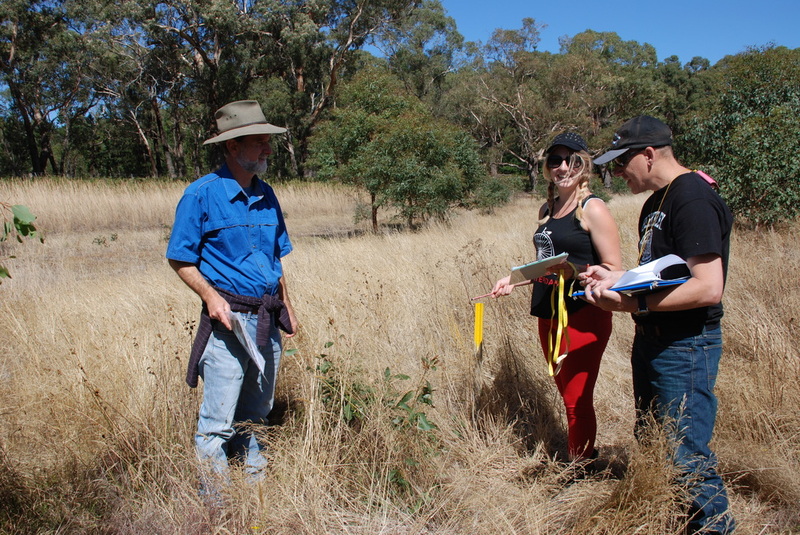 Planted species found within each grid were identified, mapped and then measured for both height using a metric tape measure and base stem diameter using a digital vernier caliper. Four photographs were taken at each plot, from one corner diagonally towards the opposite corner. These photos provide a base layer for future photo point monitoring at the site. This study shows that the ImLal South Biorich plantation has an 87.96% survival rate after approximately 10 months. A total of 2,980 tube stock were planted at the ImLal South site comprising 40 species belonging to 15 families. 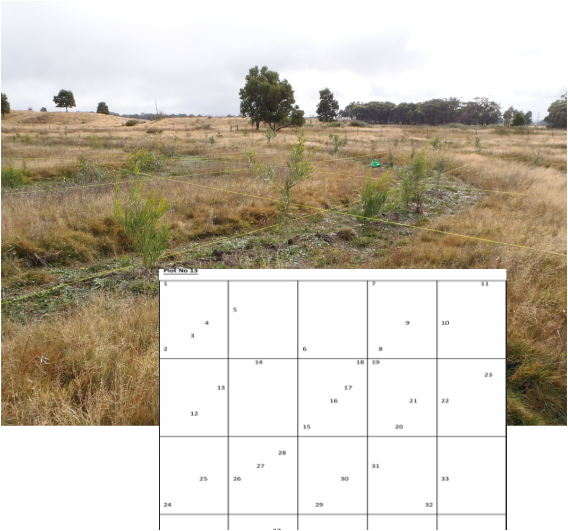 In this study a total of 573 seedlings were recorded within 15 plots. Of this, 69 (12.04%) seedlings were found dead. The surviving plants comprise 27 species belonging to 11 families with a mix of 82% restoration and 18% forestry species. Frost is limiting the growth of the plantation with approx. 20% affected. 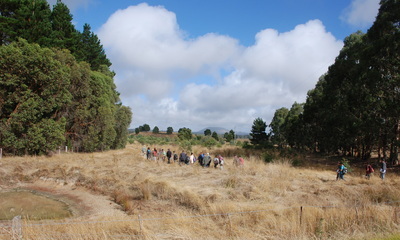 Temperatures of below -2° were recorded during each month of June, July and August 2011 at nearby Ballarat (BOM 2011). Of the 504 surviving plants recorded, 14.28%, 2.57% and 3.37% were mildly, moderately and severely frost affected respectively. Of the total surviving plants, 21.25% of the restoration and 16.12% of the forestry species were frost affected. 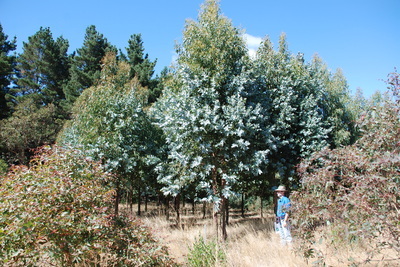 Forestry species such as Corymbia maculata, indigenous to the east coast of New South Wales, have proven to be particularly susceptible to frost damage at a site such as this. As all species of the plantation were planted concurrently, indigenous species such as Acacia verticillata, Goodenia ovata and Solanum laciniatum were also severely frost affected without canopy protection. 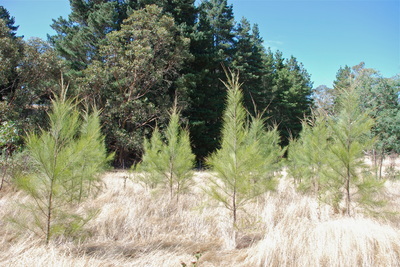 Evidence of rabbit grazing has been observed, most predominantly upon Allocasuarina littoralis seedlings. Blood and bone was used as a rabbit deterrent initially with little apparent effect. 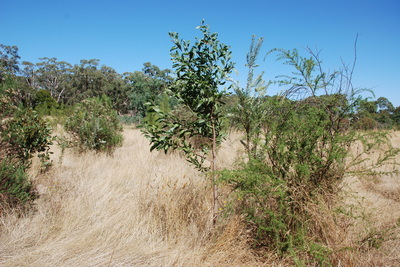 Tree guards have since been employed around these plants with evidence of new growth observed. 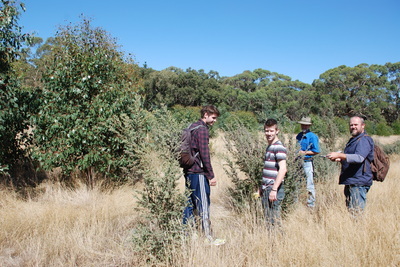 3.76% of the plants showed evidence of grazing – 1.78% mildly, 1.58% moderately and 0.39% severely. Of the total surviving plants, 4.34% of the restoration and 1.07% of the forestry species were grazed. Indigenous eucalypt species such as Eucalyptus ovata and Euc viminalis have recorded the highest growth rates of the seven species monitored. In conclusion, successional planting on a site such as this may help minimise losses. This would involve establishing the canopy first, then any frost sensitive understorey species in a later planting. Where forestry species are incorporated into a biorich plantation for economic benefits, the selection of species that have a high chance of survival (e.g. they are not frost-prone) could prove more economically viable. Tree guards have proven effective at preventing grazing by rabbits.